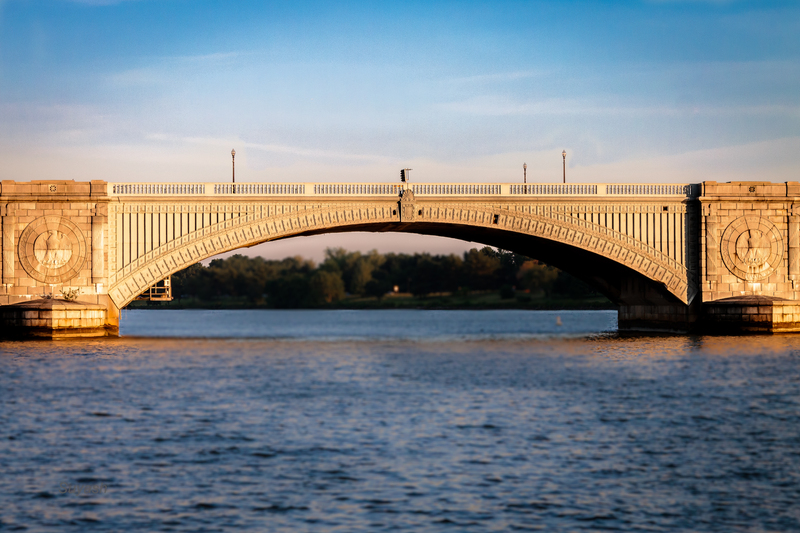 Since then, nine spans of this bridge have stood the test of time, as the testimony of a nation’s development, except in the recent past when two lanes of the bridge have been closed due to the deteriorating condition of the bridge. 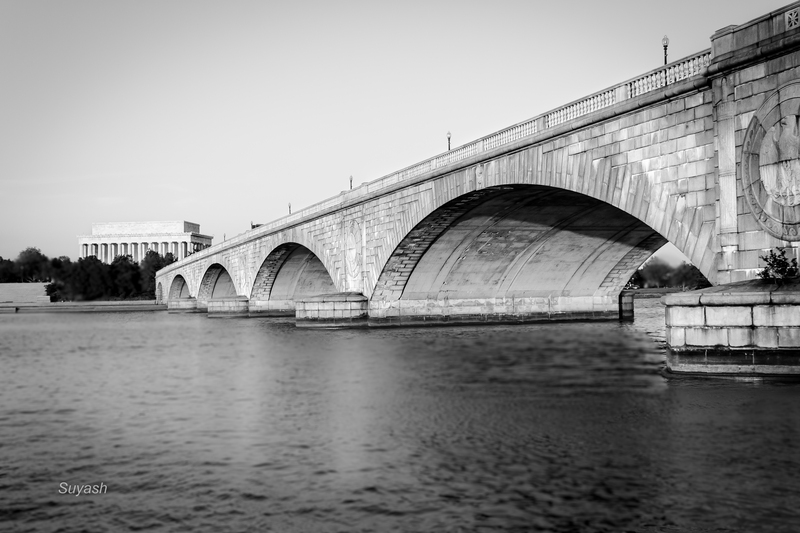 Despite this, Arlington Memorial Bridge, spanning 659 m long, is a beautiful piece of architecture and history. At the entrance of the bridge, closer to the Lincoln Memorial side, there are two magnificent bronze sculptures, Sacrifice and Valor, featuring horse-riders. Arlington National Cemetery end of the bridge features two massive eagles, national bird of USA, on each pylon of the bridge. There are several other impressive art works around worth exploring. 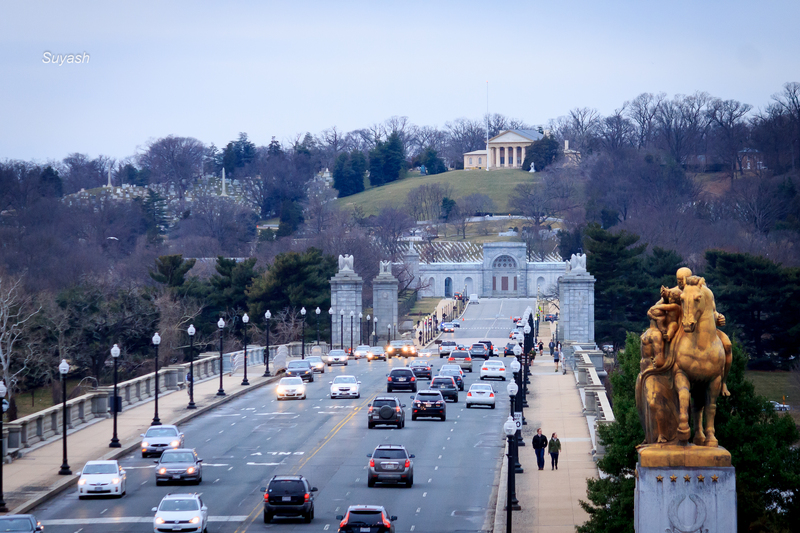 This bridge is considered to be the avenue of heroes, where the bodies of martyrs from several USA wars have marched towards their final resting place in Arlington National Cemetery. How to Reach: Closest metro station is Arlington National Cemetery. From there, it is a 2 minute walk to the bridge. 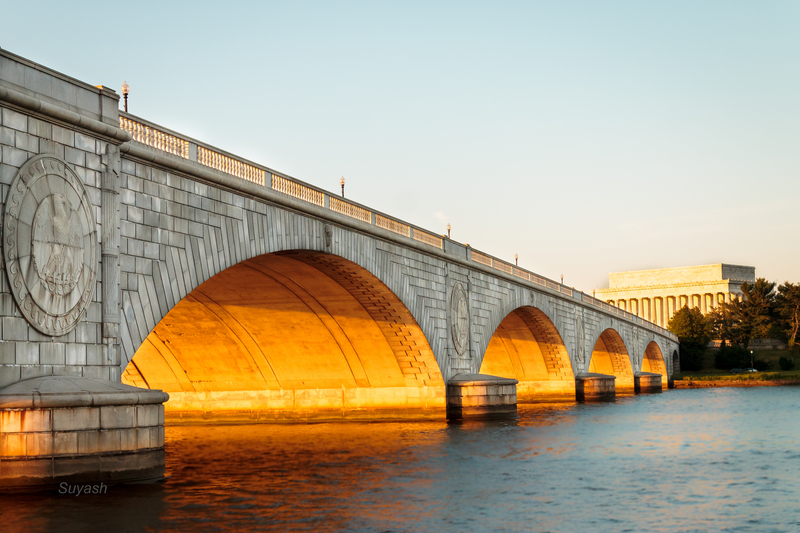 Another way to enjoy the beauty of this bridge is by a boat or cruise ride, starting from Georgetown harbor. Things to Do: Best thing to do is to walk the length of the bridge. Biking is another popular option. 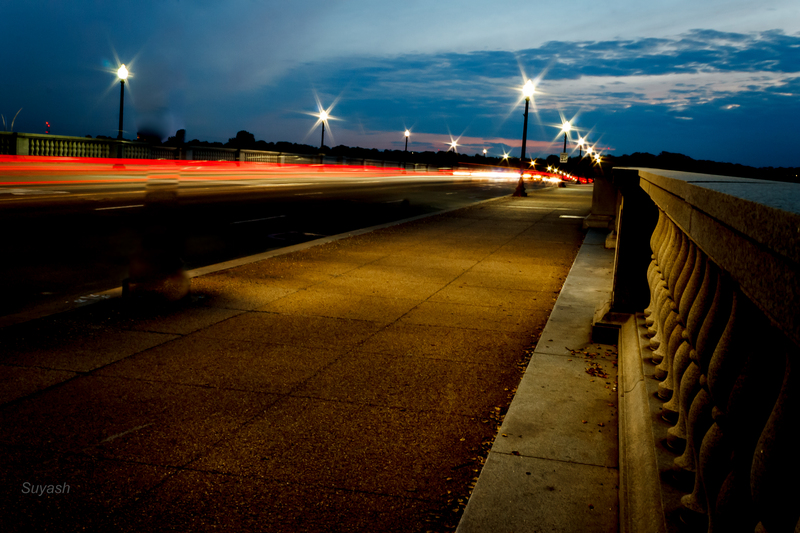 In the morning and evening, you can find several locals jogging around and on the bridge due to its proximity to Mount Vernon trail. Best Time to Visit: Bridge is open at all hours. But one of the best time, whether you are a photographer or not, is undoubtedly during sunset when the bridge and its bronze sculptures brightens up due to the golden rays of the setting sun. It is worth enjoying this spectacle both from Lincoln Memorial and Arlington House on the hill at the Cemetery. 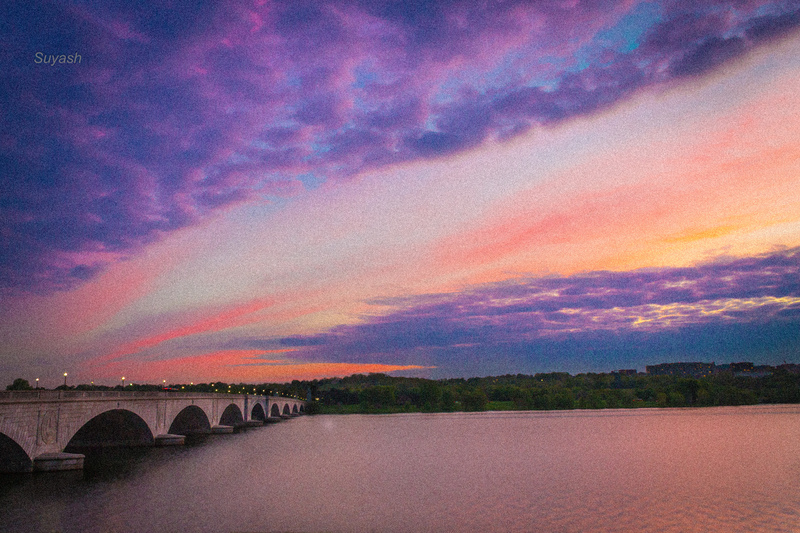 This entry was posted in Art & Culture, Photography, Sunset, Travel, USA and tagged Arlington Bridge Washington DC, Arlington Memorial Bridge Washington DC, Arlington National Cemetery, Georgetown in Washington DC, Inspiration for Travel, Lincoln Memorial Washington, Mount Vernon Trail, Photography, Potomac River, The Arts of War Sculpture, Things to do in Washington DC, Travel, Twilight Best to Photography, USA. Bookmark the permalink. Lovely images from different angles and at different time! Correction -nice post! I really liked two side shots of the bridge! Great shots! Beautiful images, you did take all possible angles to capture the bridge 🙂 Great entry to the challenge! Beautiful photos for this week’s challenge.